Today, we’re excited to welcome 2L Gabriella Martin, who’s talking about a very important topic — why you need friends in law school! Seriously, these are the people who will get you through, so read on. Sometimes law school gives you such tunnel vision that it can be difficult to see beyond your own casebook, but if you look up you’ll discover a crucial tool that will help you get through to that almighty bar exam without losing your mind. Whether it was the person or persons that you met at Orientation or a connection that you forged at a student organization interest meeting, I am sure that even as a budding 1L you can point to who this person is or will be. It’s the person who moves outside (or maybe never even existed in the first place) in the study group/classmate bubble. And while you may already have this friendship, you may not be using it to its full advantage. Using a friendship? Even saying that seems blasphemous in the face of every principle of friendship we’ve been taught since birth. Yet in law school, where you’re thrown in the deep end with no knowledge of how to swim, success and survival depends on cataloging your resources and using them to help you stay afloat—and your law school best friend is like a pair of top-of-the-line floaties. Or as my best friend would probably say, a pair of Kate Spade floaties that are both fashionable and helpful. So you have your floaties, but how can they possibly help you when that pool is swirling faster than white water rapids and full of sharks? Well, let me start by telling you about my own law school best friend, Katie Day. It started as most law school friendships do: a connection that blossomed from a shared interest. In our case it came from attending the same Christian Legal Society interest meeting. From there it grew (even though we were in two different programs), until we were going on different weekend adventures all around New England. 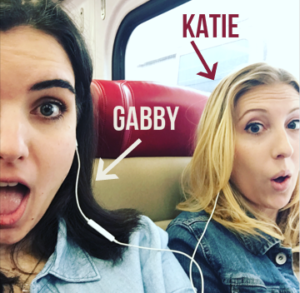 After my somewhat disastrous first semester of law school, I found myself unconsciously leaning on Katie more and more especially when it came to school-related things. So I wanted to share with all of you some of the ways Katie and I help each other, with the hope that you can use these to grow your law school friendships and stay sane throughout this crazy process. Use each other’s ears. While it’s a tricky business to find someone that you can vent your law school-related frustrations to—both people inside and outside of school have their various advantages and disadvantages—your best friend can fill this role in spades. As a slightly paranoid person, I wouldn’t advise venting about your frustrations regarding fellow classmates with a person you’ve only known for a month or so, but hopefully you have your own well-developed trust tests and once passing them, your friendship will be a safe space for yelling, cursing, and possibly crying about all the less than favorable things law school tends to throw at you. Whether it’s in your texts or on the couch over a glass of wine, using your friendship bubble as a place to call a class, a case, or a classmate stupid (usually multiple times) is more relaxing then any yoga class you could take. Your friend’s ear is also prime for bouncing ideas off of, sharing confusions with a case or an assignment, or asking for reminders (Katie constantly puts Siri to shame). Use each other’s brains. It’s no secret that law schools admit an intellectually diverse class—each student is a unique lawyer-in-training, their minds approaching problems and situations in different ways. But don’t let this just be a feature used by admissions to keep the legal field from being an army of robots. Taking advantage of your best friend’s different way of thinking will come in handy not just in classes you have together, but also in comparing studying techniques and other ways of approaching a class. Although just mentioned in passing, Katie’s trick of reading through cases and then taking notes caused a monumental shift in my studying, helping me feel a lot more prepared for class than I ever did before. Use each other’s voice. No, I’m not saying you need to pull an Ursala here, but oddly enough your best friend’s voice will be a key factor in keeping you on track in law school. Sometimes in the many demands of student organizations or attractive offers from organizations both in and out of school, your own voice can get lost or if you’re like me, that voice has not fully learned the value of the word “no.” In contrast, your best friend’s voice is amplified by a megaphone both to you and others around you. Your best friend knows your schedule, knows how many commitments you already have and most importantly, they know how difficult it is to say no and because they love you, they will (or can be asked) to do it for you. Whether you’re like most people and just give each other a subtle nudge or a shake of the head, or you’re like Katie who has now finally barred me from volunteering for anything, your best friend’s voice can keep you from spreading yourself too thin and losing focus of why you’re in law school in the first place. Some of these things you may be doing unconsciously or you may not be doing at all, but they are all crucial to making sure you get through what can be a grueling three years with a smile. So take advantage of those law school friendships. Trust me, each of you will thank me for it.